It will not work for you or me. Go to bed and worry no more. Because Santa Claus is coming tonight! Hang on the outside of your door on Christmas Eve so Santa can get in when you don't have a chimney! Cute Rudolph embroidered on white felt. Measures 4" by 2" not including ribbon. 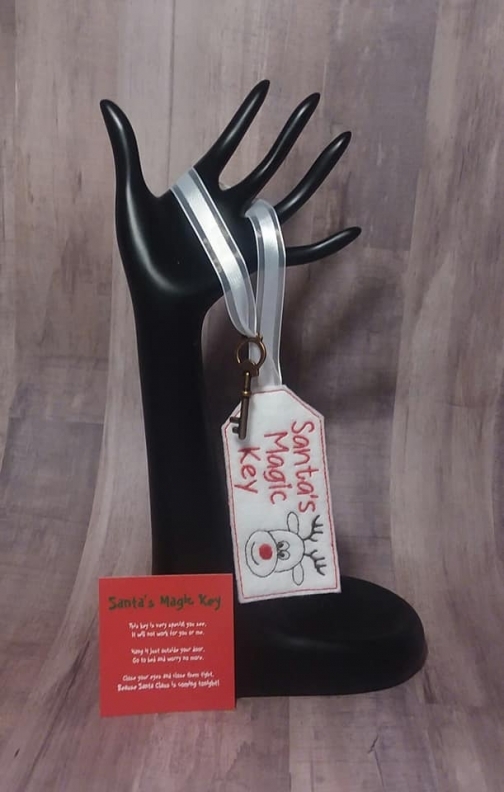 Key is 2"
Item ships from: Lake City, FL, US. $3.00 USD ($0.25 USD when combined with another item) by USPS. I only charge exact shipping cost, no extra fees are added on. If for some reason it isn't calculated correctly I will refund the overage. If the option is not there for your specific country, please message me and I will fix it. I will ship anywhere. If you are not happy once receiving your order, please message me to see if there is a solution we can come up with. If there isn't, I will issue a refund upon receiving the item(s) back. Return shipping is the customers responsibility. I will refund the total cost of the original purchase IF customer gives me a tracking number showing that item(s) were shipped within the 7 day period. I will issue that refund once I receive it back. I will not pay return shipping, but I will refund the original shipping and price of item(s).